Tekken 7 won’t hit home consoles in the US for a few more days, but competition in the game is already heated. At Combo Breaker 2017, a multi-fighting-game tournament taking place this weekend in Illinois, the winner’s finals of one pool essentially went to overtime after a double knockout. 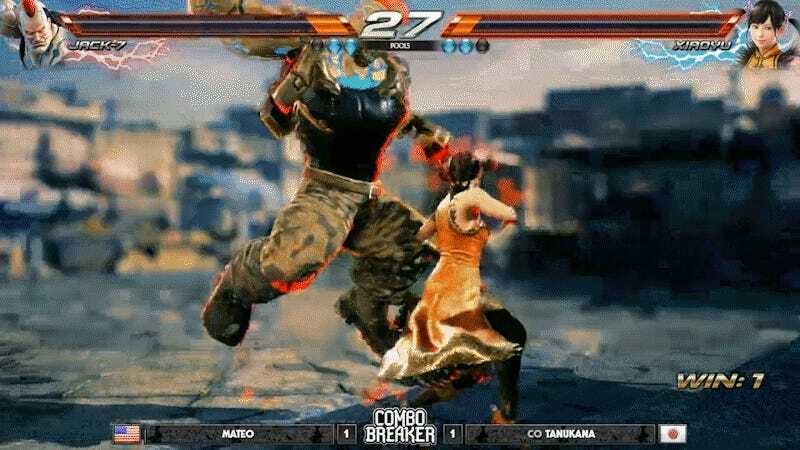 As Mateo on Jack-7 went in for a jumping overhead punch, Tanukana’s Xiaoyu executed her Rage Art—a super-move finisher that would close out the set. While the Rage Art still hit because it has ‘armor,’ which means it can’t get stuffed by the opponent’s punches or kicks, Xiaoyu still takes damage from the punch as she passes under it, enough to knock her out. Both react with shock, looking around for a judge to make the call. Interestingly enough, a search through both the Combo Breaker 2017 event rules and the Tekken 7 World Tour rules elicited nothing related to double knockouts, so the fighters simply had to play out a new set, calling the last one a wash. Though Tanukana seemed almost happy to be playing another round, Mateo was visibly tilted, as you can see at the end of this round after Tanukana went up 2-0 in the deciding game. Tanukana closed out the rematch in the next round, taking the set 2-1 and qualifying out of the winner’s side of her pool. The Tekken action is on break for the moment, but will start up again at 4 p.m. CT when the top 24 are whittled down to eight, and then at 8 p.m. the top eight will play to see who takes home the lion’s share of the prize pool.